Chanukah begins at sunset this evening. 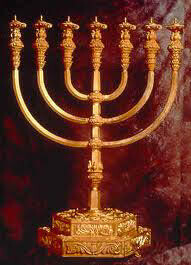 Chanukah celebrates two miracles: (1) the defeat of the vastly superior Greek army that occupied the Holy Land by a small army (the Maccabes) in the second century BC and (2) the olive oil which was used in the rededication of the Holy Temple which should have lasted for only one day burned for eight days and nights. Chanukah is not a biblical holiday since it was instituted two centuries after the Bible was completed and canonized. It is traditionally celebrated publicly by positioning the Chanukah menorah at the door or window. On the first night of Chanukah, one candle is lit to the far right of the menorah. On the following night add a second light to the left of the first one, and then add one light each night of Chanukah—moving from right to left. Each night, light the newest (leftmost) candle first, and continue lighting from left to right. Lights are added to the menorah from right to left, and are lit from left to right. The ninth candle is called the shamash or “attendant” candle. It is used to light the other ones. Because of the central role that oil played in the Chanukah miracle, it is customary to serve foods fried in oil. Dairy food is also served. A totally cool custom among Sephardic residents of Jerusalem is to arrange communal meals during the eight days of Chanukah. Friends who quarreled during the year traditionally reconcile at these meals. All of the info above was taken from an extremely informative site. Check it out at: http://www.chabad.org/holidays/chanukah/article_cdo/aid/605036/jewish/Chanukah-FAQs.htm. Happy Chanukah to all who will begin their celebration this evening.